Our beautiful Bentley Flying Spur is the epitome of luxury and class and you can arrive at your wedding venue, church or registry office embodied in its refined comforts. Let your cares slip away as you are chauffeured to your wedding in one of today’s most sought after luxury cars. The Bentley Flying Spur is known for its strength of presence and its formidable approach to design and comfort; it will let the world know that you have arrived. 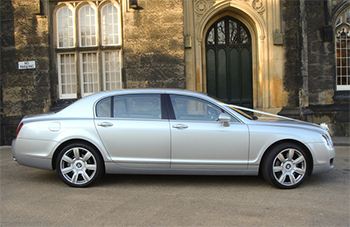 When you book a Bentley Flying Spur from Leicester Executive Chauffeurs, you will know that not only are you getting the best the automotive world has to offer, but you will receive the quality care and service that only comes from years of experience in the chauffeured transport industry. Our professional chauffeurs will arrive on time and in full classic chauffeur attire. They will transport the bride and her father as you both sit wistfully thinking about the day ahead. Upon arrival at your chosen venue, church or at the registry office, our chauffeurs will provide ample waiting time while your ceremony takes place. You will then be transported, if necessary, to your wedding reception and given the opportunity to take as many photographs as you need to capture the essence of your special day. Our exclusive No Rush Guarantee means that you will never feel rushed or hurried in any way. You will arrive on time and in style; you have our word on it. Leicester Executive Chauffeurs wants you to know that each and every customer is important to us and we go out of our way to ensure their complete satisfaction. Whether you need bride and father transport, groom and best man transport or chauffeured services for the entire wedding party, Leicester Executive Chauffeurs has a package to suit your needs. 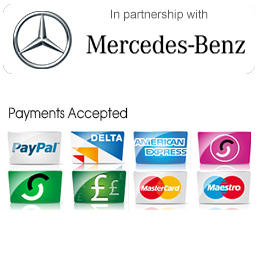 We offer luxury, style and affordability and can guarantee the highest level of service for all of our customers.